Creating an unforgettable customer experience which significantly ramps up customer engagement is every marketer’s dream. During the 2014 soccer world cup, Pepsi ran a campaign using augmented reality (AR) technology on a smartphone with 250 million interactive cans allowing fans to play a soccer match with the world’s five leading players. The campaign saw 60,000 hours of engagement with Pepsi cans in the space of a month and around 3.5 million people ‘blipped’ their cans – creating significant brand awareness, virality and a lot of social media noise at a fraction of the cost of an equivalent TV campaign. Maybelline’s virtual nail polish testing campaign, in addition to driving customer engagement, enabled identification of the most popular colours to manufacture and stock. Although a tightly regulated space such as healthcare throws up challenges when considering advanced digital solutions for engaging and educating HCPs and patients, the ability of such technology to deconstruct and demystify the complex world of medicine offers an unprecedented opportunity to break out of the traditional methods of pharmaceutical marketing. Interactive 3D animation, virtual reality (VR) and AR, are no longer solely the remit of gamers and movie-makers – they are rapidly becoming powerful marketing and engagement tools and have already made their way into different areas of healthcare. AccuVein displays vasculature on the skin surface, Google Glass can overlay information in a clinician’s field of vision allowing access to patient information in real time, the VR operating room simulator allows trainee surgeons to practice without stepping into an actual operating theatre, and Microsoft HoloLens can replace cadavers in teaching anatomy to medical students. Just as 3D imaging has become an indispensable tool in advancing medical diagnosis and treatment (think CT scans), interactive 3D animation is proving as useful in other aspects of healthcare, marrying up traditional medical illustration with modern digital technology to bring medical imagery to life. It’s a natural progression considering all anatomical structures, including microscopic ones, exist in three dimensions. In medical education and training, the use of animation has been shown to improve understanding and retention of complex topics and procedures. To the medical marketer, 3D animations can communicate information around complex concepts, procedures, devices and mechanisms of action far more succinctly and engagingly than static graphics and text. Touch navigation on 3D animated presentations enables audiences to interact and control what they see, taking a deep dive into areas of interest. Structured well, it can enable the marketer to address different audience needs and viewpoints, and provide a wealth of information that is organised for easy access. Taking 3D animation to the next level are VR and AR technologies which, by delivering an immersive experience in virtual or real space, have much greater appeal to the ‘digital generations’ who have grown up with VR gaming. In healthcare, such technologies ease the transition from training to practice with devices allowing 360 degree visualisation, the ability to view multiple images simultaneously and overlay images to provide simulations of real life scenarios. The addition of haptics provides users with tactile feedback which, for example, can be used to differentiate tissue components in anatomy training. Engaging multiple senses, AR and VR experiences represent a paradigm shift in how the pharmaceutical industry can engage with both HCPs and patients. At the 2016 American College of Cardiology meeting, Boehringer Ingelheim immersed participants in the blood stream using VR headgear, to demonstrate the Pradaxa reversal agent, Praxbind. The positive response from attendees led to the dissemination of this experience in the field using Google Cardboard and a downloadable app. Being dramatically different to what has come before, the excitement and engagement of VR and AR content experiences are perfect for product launch, education, training and awareness campaigns. Additionally, real time dashboards can quantify the number of users and their interactions as well as the duration and location of interactions. Medical and surgical practice is already using or investigating these advanced digital technologies. Surgery has always been an early adopter of new technologies that enhance training and practice, with a number of examples of AR and VR already implemented and more being explored. In general medicine, the potential of VR and AR technology is already being utilised in pain management, exposure therapy, stroke rehabilitation for visualising complex medical data (e.g. hemodynamics in cerebral aneurysms or identifying a hemodynamic scenario predictive of aneurysm rupture) and patient education. The functioning of medical infrastructure has been enhanced by the use of such technology in pre-procedural planning; retrieving patient records using facial recognition; and concurrent electronic review of lab results, clinic notes and medications with live vital signs. The widespread adoption of this technology in healthcare presents a challenge to the efficient, secure and ethical management of potentially confidential information. Whichever system is used, it will need to meet the standards for health care information governance. What is indisputable is that healthcare is ripe for AR and VR disruption. 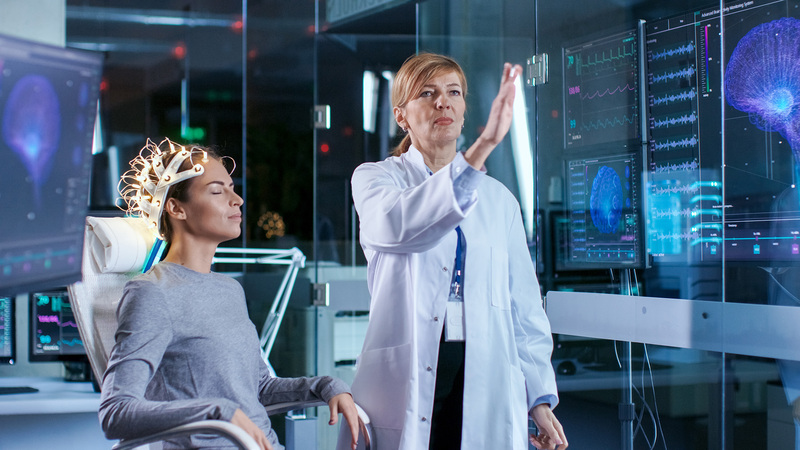 Boosted by improvements in processing power, affordability and accessibility there will inevitably be an increasing number of drivers of this technology into clinical training and practice – the ‘perfect storm’ for success.